We propose this project as a continuous two-day installation, with a one hour performance twice a day. Our work is grounded in improvisation and real-time music making. Through the exploration of indeterminate and dysfunctional systems, we embrace ambiguity as creative tool and catalyst, a strategy to probe, provoke and generate. For this project we will be engaging with mechanical and electronic systems which ostensibly display autonomy. Using multiple turntables (some modified) and a computer-based audio manipulation system we will present an organically-evolving composition in an immersive surround sound environment. The turntable can be figured as a memory machine, playing-back sounds from the past. The computer will be used as a complex, semi-automated memory machine, extending the event by leaving traces of the performance and reacting to visitors within the space. 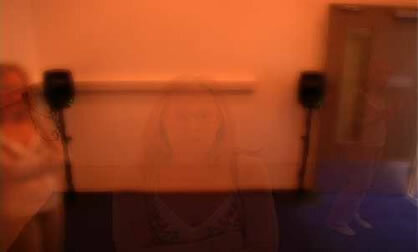 Click here to view a QuickTime movie of Memory Machines recorded at Connecting Principle.